My name is Eran Henig and I have had the privilege for the last year of being the Google Campus Ambassador at the University of Toronto. 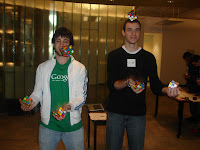 I was given the opportunity to write a post about my experiences during the last year, so I decided to blog about one of the best events I have held to date, the Google-Rubik’s-Cube workshop! 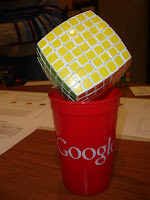 During the event Google Rubik’s Cubes were distributed to the students and we all tried to solve them together. Colorful beginner’s method posters were taped to different surfaces so that the students would have a better chance of actually solving the cube using proper technique. 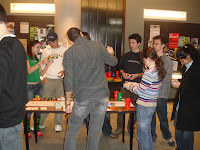 The department’s Rubik’s Cube expert (he averages around 16 seconds!) acted as a teacher, gave some live demonstrations, and guided everyone. I lured students in with chips and pop, YouTube videos of the greatest Rubik’s cube experts, and really managed to draw quite a crowd to the workshop area, as you can tell by some of the photos below. If you're the Ambassador at your school - or even if you just want to spread the word about Google to your classmates - I would strongly encourage holding events like this - your campus will thank you! Take from us here in the CS Department here at UofT, it was a blast! Hiii . I wish to hold a similar workshop on my college campus. Can you please tell me how to go about it and whom to contact !